The temperature might be 95 degrees on a July day, but the sight of its yellow blossoms can offer a chill that’s autumnal. New Englanders used to say Early Goldenrod’s appearance presaged an early winter, but as its name suggests, this species always blooms in July. Early Goldenrod is just one of nearly 50 kinds of goldenrods found in the Northeast, most blooming in late summer and fall. All are subject of another, more serious misconception: They are said to cause hay fever. It’s simply not true. 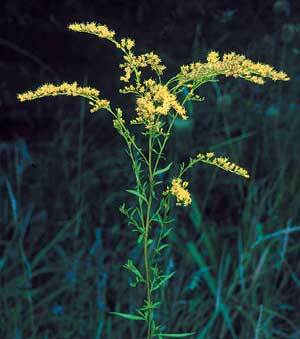 Goldenrods bear colorful flowers that attract insects. Their pollen grains, designed to be carried by bees, are too big to become airborne and to end up in the noses of allergy sufferers. The real villains are grasses, plantains and ragweeds, which bear green flowers and dispatch their tiny pollen into the air. In fact, any time you see a colorful flower, you can bet the display is aimed at attracting bees and that the pollen is too big to bug you. It’s the unnoticed, dull, green flowers that create the season for sneezin’.